The Kruger National Park is South Africa’s oldest and largest national park. Approximately 950 000 people visit this prized park each year. Both local and international visitors are astounded by the sheer size and diversity of wildlife and habitats in this corner of the country that is about the size of Israel. How did the Kruger National Park come into being? We delve into a brief history of the area so that you can brush up on your knowledge before your safari in South Africa. The area of the Kruger National Park borders Zimbabwe and Mozambique, creating an ancient history that transcends the current borders. Archeological sites have been uncovered and analysed and the findings have proved the evidence of Homo erectus having lived and hunted in the area almost 500 000 million years ago. The discovery of stone tools and artifacts from 100 000 to 300 000 years ago also proves an Iron Age and Stone Age past. Over the millions of years that followed, the area was inhibited by the San people (the oldest group of people in Southern Africa who practiced extensive rock art) and the Nguni people. Finally, the Tsonga group settled into the area permanently. In more modern times, colonialism saw Europeans finally move into the area. The land was used throughout the ages for agriculture and grazing lands for both nomadic and permanent herdsmen. Kruger National Park in 1898. Trohpy hunting was rife during this time. In the 1800’s people hunted extensively in the area, killing all manner of mammals for sport and game for food, entirely unpoliced. This destruction by humans saw the then-government of the South African Republic call a motion to protect this biodiverse stretch of land in 1985. 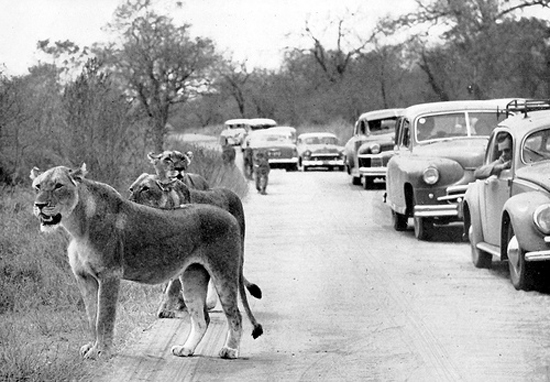 It wasn’t until 1898 that the motion for the development of Kruger park was implemented. The credit for this can be attributed to president Paul Kruger, who established the original park between the Olifants and Sabie rivers that flow through the land. The park was called the Sabi “Wildtuin” or game reserve. The park was patrolled by a single, armed warden, Stevenson-Hamilton who took up the post in 1902. A memorial library was named after him and can be visited in Skukuza. Visitors were officially allowed in the reserve in 1927. Following this, the Sabie Game Reserve was merged with Shindwezi Game Reserve according to the National Parks Act and the result is what we know as the Kruger National Park. The first visitors to the park camped in the bush and legend has it, had to climb trees in an attempt to escape hungry lions. Now, there is ample accommodation in the park so there is no need to relive this part of the Kruger’s history. In 1957, the first wilderness trails were created in the Kruger, the brainchild of game ranger, Dr Ian Player and Magquba Ntombela. These wilderness trails were designated ‘true wilderness’ areas that remain relatively untouched to this day. Later, in 1959-61, the park was fenced off from the neighbouring countries of Mozambique and Zimbabwe in order to prevent the spread of diseases across the border and for the monitoring and prevention of poaching of the park’s precious wildlife. The establishment of private reserves and concessions throughout the century has seen the Kruger Park expand into greater regions, offering a variety of world-class safari experiences to those who have fallen in love with South Africa’s national treasure. Discover the Kruger National Park for yourself with our recent South Africa 360 project, which showcases the best of the Kruger on foot. This article was originally published on Africa Encompassed; Australia's number one guide to Africa.